In my experience as a physical and energetic therapist, people with body pain have stored emotional pain. Let me break it down. Emotions have a body expression and frequency, an electrical current in the body. Shame is the lowest vibrating emotion next to grief, guilt and anger. Joy is a high vibrating emotion connecting to happiness, love, intimacy, passion and purposeful life momentum. Think about when your body expresses emotion like anger, your fists clench, chest puffs out to lash out. Joy elevates you to reach out to hug, connect, cheer, dance or sing. Energy is emotions in motion. If the emotions in motion in your body are low, you are depleted, exhausted, burnout, sleepless, anxious, depressed, numb. This drums an incessant need to numb to force your way through life. Your body is sending up flares of crisis that you may have unplugged or numbed with a roller coaster of addiction to survive – this is ultimately a path of self-destruction. If the emotions in your body have high vibrations, you feel energy, power, levity, happiness and you are in the flow of life, or as some people call it the zone of purpose and high-definition color. You can feel these high-vibrating people when they enter a room, the energy shifts and lifts. 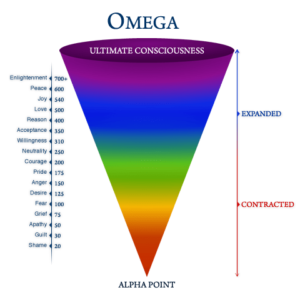 How do we enter the zone? First we have to detox the lower vibrating emotions in your body that may have become a storage house of old wounds – this is a body with gray clouds and sometimes black holes within leaking energy. These broken-hearted wounds are stored in the backside tissues of your body. The good news is we can clear your body of the gray clouds and black holes dimming your life. Black holes are essentially invisible wounds storing emotional pain in the body that have become disconnected, undetected and dissociated to your mind. These black holes will drain your energy and light. You find yourself always searching for artificial or external energy sources in other people or stimulants/drugs of choice. Disease and pain have distinct energetic patterns or frequencies that we can detect. Cancer radiates a low frequency or deficient energetic pattern in the body. The emotions involved in cancer are anger, grief, resentment, shame and guilt. I’m going to expand our understanding of a vibration or frequency to a physical expression in the body to help flesh this out for you. You can view the emotions scale developed by David Hawkins, M.D., Ph.D., author of the book, Power vs. Force, to better understand the frequency of emotion. The physical expression of shame in the body that we are all familiar with is placing your hands over your face to hide, isolate. Pulling your body inward to hide, isolate or protect yourself tightens and shortens the muscles, joints and depletes the body’s systems that overtime can lead to a bad fall, accident, an injury, inflamed tissues or organs radiating signals of crisis and pain. We have to unravel the body from its recoiled condition. Herein lies the challenge. We can use soft-tissue mobilization techniques and exercise to unravel the tighten muscles and destructive patterns. But if you continue to hold onto those old wounds radiating shame, grief, resentment, betrayal or humiliation, your body will eventually return to hiding, isolation –protecting itself. 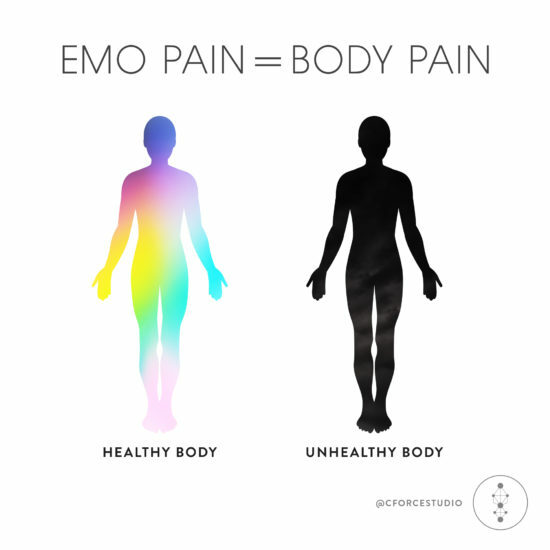 This is why we have to connect your emotions and emotional experiences to the destructive patterns of movement and posture in your body, so we can unravel the emotional root of your physical pain and disease. Once you consciously connect your body’s expressions, patterns, movement and posture radiating from your old wounds and/or invisible wounds, you can course correct. Make an appointment with Gina Calderone, the Physical and Energetic Therapist, and Denise Carson, the Body Journalist, to unravel the emotional root of your pain and disease so you can enter the zone of purpose and experience life in brilliant color.